The recipe for my Gluten-free Pumpkin (Sweet Potato) Ale Chili came to be because of a little bribery and well-intentioned pleading to my smallest recipe testers in the house. As much as my husband and I love a nice warm bowl of chili on a cold blustery day, my kids have never jumped onto our two-man chili train. And because I am always determined to make meals that we all will enjoy, I had to do some re-configuring of my old stand-by recipe to add some creative touches that might get those two on board and allow all of us the opportunity to cuddle by the fire with our piping bowls of chili-goodness. I was trying to think of some winter flavors to include that were already a sure hit with my boys. Pumpkin was the first thing that came to mind since I can throw it into just about anything with the confidence of knowing it will get consumed by them. Pumpkin has gone into my pancakes (turning them into Apple-Cider Pumpkin Pancakes), my Oatmeal Cake, my waffles (turning them into Pumpkin Pie Waffles), my risotto, my granola (recipe to come), and anything else that does not seem too obscure (and even then, it is still sometimes worth a shot..). I have grown to learn that they happily consume, without question, all things orange. Since I am not yet ready to totally give up that pumpkin, I will at least stick with that antioxidant-rich winter squash for at least one more recipe (oh, who am I kidding? I will not give it up). But, I figured I would have to add one more alluring ingredient to turn my old chili recipe into a dish that would please my little critics. Easy enough. A second favorite vegetable of theirs is the Hannah Sweet, a golden fleshed sweet potato (read here for the differences in the varieties of sweet potatoes and yams). I normally dice and roast them with a bit of olive oil, cinnamon, nutmeg, and sea salt. It is one of those side dishes that they actually ask for on a pretty regular basis. I thought this sweet flavored root vegetable would be a perfect addition to the chili, along with a dash of cinnamon to complement them. So…I went with it. And here is the dish that ensued. I will happily tell you that it was actually not met with any resistance at all from my boys, nor from my husband (maybe thanks to the 12 oz of Green’s Gluten Free Beer I added). I served it up with cornbread and everyone happily finished their bowls. Because I had to go light on the spice factor for the kids, I gave my husband the bottle of Chipotle Tabasco sauce and a bowl of diced jalapenos to spice his portion up as desired. For the kids and myself, I topped our bowls with some squeezes of fresh lime, a dollop of plain greek yogurt, and some diced avocados. The pumpkin made the chili amazingly creamy and smooth. The sweet potatoes added a perfect surprise of sweetness that went nicely with the subtle hint of cinnamon. And the beer added a richness and a layered depth to the dish. This may not be your typical chili, but I can honestly say that it now our family’s new favorite way to eat it! This is being included in Miz Helen’s Country Cottage Texas Start Chili Round-up Contest she is hosting this month. There are some amazing entries right now that you really should check out (after you make this one, of course). 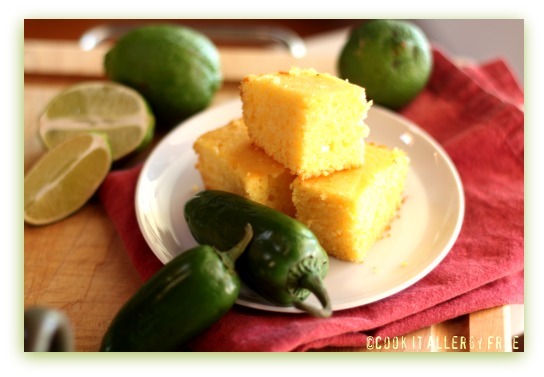 And what is chili without some good cornbread for dipping? Saute sausage in large pan with oil until brown. Remove meat from pan and drain drippings. Stir in beer, scraping pan to loosen browned bits; bring to a boil. Cook until liquid almost evaporates (about 10 minutes), stirring occasionally. Stir in paprika, cumin, cinnamon, pumpkin, and tomato paste. Cook 1 minute stirring frequently. Add sausage back to the pan with broth, tomatoes and beans, and salt; bring to a boil. Reduce heat and simmer 1 1/2 hours or until mixture is thick. Stir occasionally. Season with salt and pepper, to taste. Spoon into bowls and garnish each bowl with your choice of garnishes. How funny – I was just writing about pumpkin soups for an upcoming post, and this is one of the ones I am putting on my to-make list. I’ve just been reading the ingredients and it sounds heavenly, and very hearty! Does the beer make it or is it one of those things that could be substituted with something else? Thanks, Kim! Hey Zoe! Do not worry about adding the beer. I actually have made this twice when we had no gluten free beer left and it was just fine. The beer is just for adding another layer of flavor, but definitely does not make or break the recipe. Lots of other things going on in it to make up for it! First time here… looks really yum! Have a nice day! Hi Lani! Thanks so much for stopping by! Was just visiting your site! It is absolutely beautiful!! HI girlichef! Thanks for letting me share the recipe on Hearth and Soul this week. Pumpkin and sweet potatoes totally changed it up from my traditional chili recipe but it ended up so good. I am so excited that you brought your wonderful Pumpkin and Sweet Potato Ale Chili to the Texas Star Chili Cook Off. We are going to have so much fun! Thanks for coming over to The Country Cottage. Hi Miz Helen!! I am so glad that I am able to be a part of your Texas Star Chili Cook Off. This one is definitely different than the traditional Texas chili’s but it went over in well in my house! LOL Looks like the contest has some amazing recipes already!! So fun! Delicious, in looks and the ingredient list guarantees it! thanks. Thanks Stephanie! Mmm. GF Cider would be a really nice complement to the pumpkin and the sweet potatoes and cinnamon. You will have to let me know how it goes if you try it!! I would never have thought of adding pumpkin to chilli, but your recipe looks and sounds delicious! I will definitely have to give it a try. Hi April! 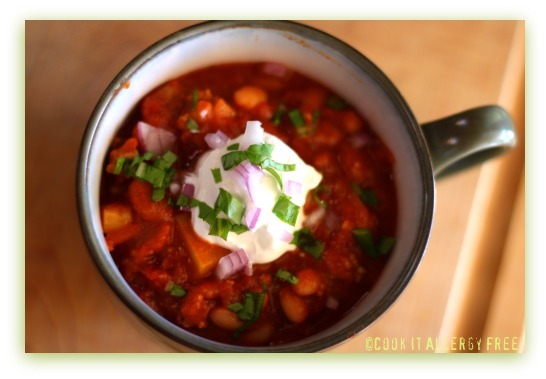 The Chili makes the chili really creamy and gives it a nice hearty flavor. I was just looking for a way to change it up for the kiddos! Hope you enjoy the flavors! Thanks Torieview! Welcome to Cook It Allergy Free! Your banana fritters look awesome! Hi Shirley! I think that you would really like it with the added pumpkin. 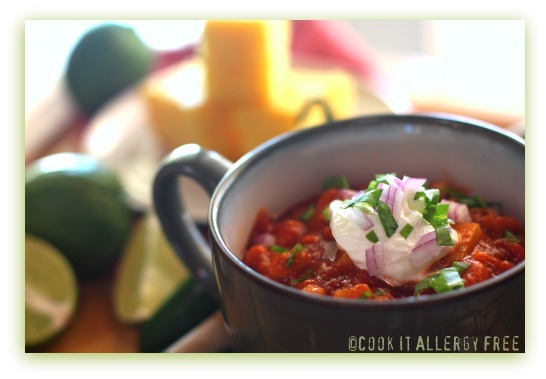 This recipe came about since I have never been able to get my kiddos to eat chili before. I actually was not even going to post about this recipe, except that both of the boys ate their whole bowls (dipping their cornbread in it the entire time as well) and I deemed that a total successful recipe, just for that fact alone. LOL And I love sweet potatoes in all of my soups and stews since it gives you a nice little unexpected sweetness in a normally savory dish! Yum! I have a pumpkin chili on my blog, but it’s amazing how decidedly different our two recipes are. This sounds AMAZING. I love any chili. I love your addition of cinnamon and sausage. Yum. I add cubes of frozen squash to my chili but I never thought to make them a major player in it – and the cinnamon, yum. I love the addition of beer too – I used to use it in my meatloaf but stopped when I ate gluten free (no access to g/f beer) – it just adds a bit of something special! Thanks for sharing this with us at the hearth and soul hop! Hi Chrisy! Ooh! Beer in meatloaf? I have not ever tried that before. That is something that I will have to give a go. Is that instead of any other liquids (like milk)? That does sound amazing! I would probably just keep it mild too, but that is for our adult taste buds. This looks really interesting. i think I’m going to try a variation of this with some venison that a colleague gave me recently. Mmmmmm. How does the gluten-free beer taste? I can only get one kind around here and its not that great. Thanks for posting the link to the difference between sweet potatoes and yams. I am an ethnobotanist by training and I have talked to many a grocer about the difference and they all just look at me like I’m crazy. I ask… where’s the sweet potatoes, and they point me to the yams. I actually can’t seem to find sweet potatoes in the stores so much any more. Can you? Anyway, looks like a great chili. I can’t wait to give it a try! Hi Heather! There are some pretty decent gluten free beers out there right now. I would say one of our favorite’s is Green’s right now. And I cannot believe how some grocer’s do not even know the difference between the sweet potatoes and the yams. It bewilders me. By the way, how cool that you are an ethnobotanist – that is totally fascinating. I agree that it is difficult to find true sweet potatoes, but my Whole Foods will have them pretty often. Oh yum! Is there anything the almighty pumpkin can’t do? This sounds delicious! I would never have thought to put sweet potatoes or pumpkin in chili. I bet it’s delicious. Great job on adapting a recipe for your kids to enjoy. Hi Linda! Coming up with alternative ways to get my kids to eat new foods is my specialty, LOL!! But luckily this one turned out really yummy! HI IntolerantChef! I love the flavors that sweet potatoes add to soups and stews!! Yum! Thanks for linking-up! Check back next week we are doing Thanksgiving treats! Kim, I made this last night and the whole family loved it! I will make this again for sure. Thanks for a great recipe! Hey Robbie! So glad you like it! 😉 Thanks for letting me know! I miss you! Hope you, Steve, and the girls are all doing well! I so need to call you and catch up!